“TADKA” is serving an authentic southern Indian curries. You may feel comfortable with relaxing atmosphere inside of the restaurant. What we liked the most was that they are very careful about choosing the high quality and safe ingredients. They use pesticide-free and organic ingredients and purchase seasonable vegetables from trusted greengrocers and farmers. As beans and spices are all from India, you must be experiencing the rich aroma in your curries. Interestingly, southern Indian curry is usually mixed all together with rice, so you may enjoy the different flavors at the same time in your mouth! They serve set menu for lunch and a la carte for dinner. 6 kinds of curries such as DAL TADKA, TOMATO RASAM and SAMBHAR would come along with Roti, an Indian Subcontinent flat bread, pickled vegetables and rice. We recommend that you eat by an authentic manner- mixing all together with curries and rice! You may like the texture and flavor of rice as Japanese rice and aromatic Thai rice are blended. Curries are not so spicy but you may enjoy the different kinds of spices imported from India. We suggest that you put some Roti to the mixed curry so that you can enjoy different texture. Curries are changed every day. Today’s special was DAL TADKA, the bean curry, TOMATO RASAM, the tomato pepper curry and SABZI, potatoes and cauliflower’s pepper fry. You may enjoy 3 kinds of curries both with rice and naan as they have different textures. TOMATO RASAM is our favorite as spices and herbs's flavor spread in your mouth richly. DAL TADKA and SABZI are not spicy but rather have mild and sweet tastes which are well balanced with the spicy TOMATO RASAM. You may taste the various kinds of spices only by one sip which makes your body very warm. If you visit after 1:00p.m., you can have a free refill on hot chai tea. You can order cold chai tea as well but you won’t be able to have a free refill. You need to order at cashier when you enter the restaurant. The menu is written simply in English for lunch time and written in detail for dinner time. Staff are kind and friendly, so please feel free to ask any questions regarding their menu, dishes or ingredients. If you are vegetarian, you may be content that different kinds of vegetarian curries are available here. We recommend that you order hot chai tea as you can have a free refill. 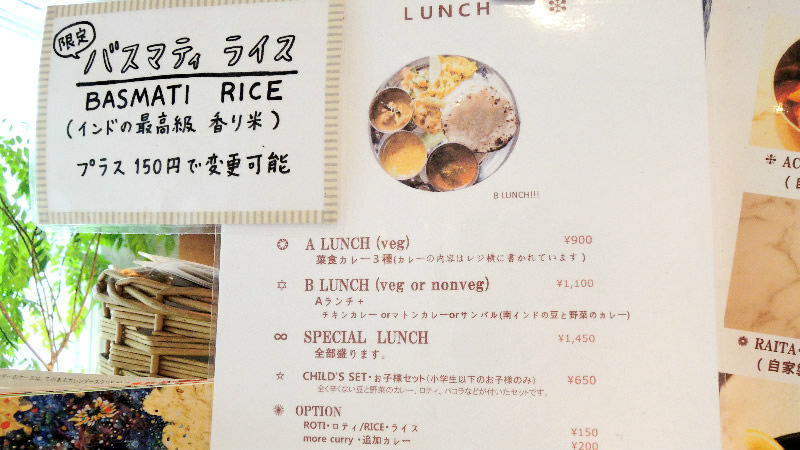 If you order “B lunch”, you can choose either vegetarian or non-vegetarian curries. There is also a non-spicy curry set for children, so families with small children are also welcomed! Their special curry set has five different types of curry and a type of sour yogurt, and a little bit on-the-hard-side rice, and the spiciness of these curries is just right, so it is easy to just keep on eating! And their Indian milk tea is not too sweet but still quite thick and strong, and I hope you all will get a glass of it! This is an Indian restaurant that offers all kinds of curries, some better than others, and their food is really healthy. The rice they use is a bit on the hard side, so this place is great for those who like their rice al dente. There would be crowded around 12:00p.m. to 1:00p.m. We recommend that you make a reservation before you visit. Please note that they don’t take a reservation on Saturday and holiday.